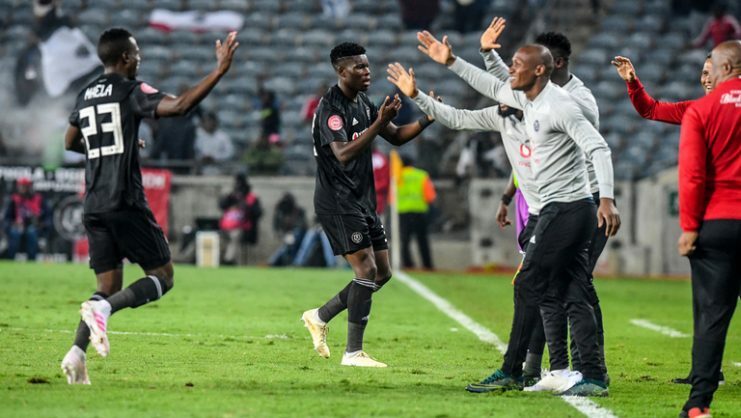 This week on our weekend review, Phakaaathi’s Khaya Ndubane and Tshepo Ntsoelengoe look at this past weekend’s Premiership games as well as the Caf Champions League clash between Al Ahly and Mamelodi Sundowns. Orlando Pirates extended their lead at the top of the log after a hard fought 2-1 win over Free State Stars. Bucs now lead second-placed Sundowns by six points, but the Brazilians have three games in hand due to their Caf commitment. Ugly scenes were seen at Dr Molemela Stadium and the game between Bloemfontein Celtic and Cape Town City was called after after a pitch invasion by some Celtic fans. Maritzburg United suffered a 1-0 loss to Highlands Park to remained rooted at the bottom of the log standings. Things are not looking good for Eric Tinkler’s side. Sundowns reached the semi-finals of the Caf Champions League despite their 1-0 loss to Al Ahly. The Brazilians went through on 5-1 aggregate and they will face Wydad Athletic Club in the last four.